What additional capabilities does GeoPandas provide, including data access, plotting and analysis? How does it integrate with other common Python tools? How do GeoPandas data objects integrate with analyses of raster data over vector geospatial features? Explore additional GeoPandas capabilities in reading from PostGIS and using its plot method. 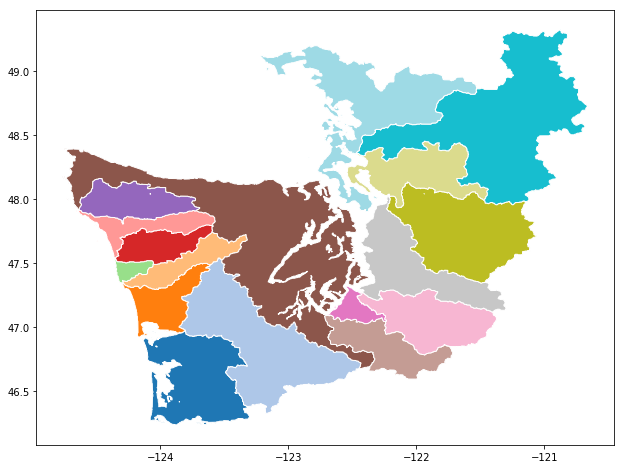 Learn how to dissolve (aggregate) polygons into larger units, and apply spatial joins across GeoDataFrames, as examples of GeoPandas spatial operators. Learn how to explore project (CRS) information and reproject. Explore simple but powerful capabilities offered by the rasterstats package to generate summaries and statistics of raster properties over vector features, and explore these via GeoPandas. We covered the basics of GeoPandas in the previous episode and notebook. 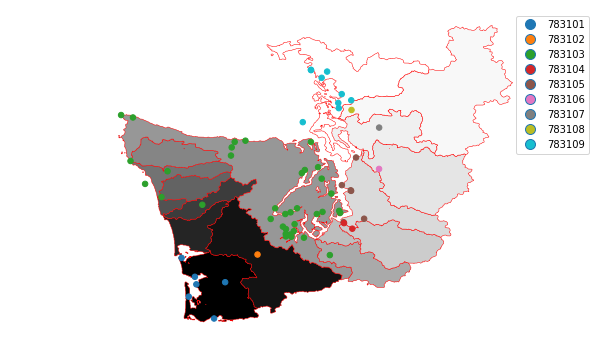 Here, we’ll extend that introduction to illustrate additional aspects of GeoPandas and its interactions with other Python libraries, covering fancier mapping, analysis (unitary and binary spatial operators), raster zonal stats + GeoPandas. We’ll use these throughout the rest of the tutorial. Read HydroBASINS “all-levels” (lev00) hierarchical watersheds dataset for North America and the Caribbean (hybas_na_lev00_v1c), from Amazon Cloud PostgreSQL/PostGIS database. Watersheds in the dataset are at the finest (highest resolution) “Pfastetter” hierarchical level, level 12. HydroBASINS dataset technical documentation is here. read_postgis is called as before, except now we’ll apply a SQL filter (server side) to the PostGIS dataset to select only the Pfastetter level-4 watershed with code 7831: WHERE pfaf_4 = 7831. This is most of Western Washington. Watershed polygons will still be read at their original level 12 resolution. 413 polygon features returned. Let’s examine the attributes available, using the first feature as an example. Plot a categorical map with coloring based on the aggregating column pfaf_7. Watershed boundaries are at the high-resolution Pfastetter level 12. Note: pick a color map (cmap) appropriate for your data. Get to know the matplotlib color maps. Unfortunately, folium choropleth and rasterstats (demonstrated below) require the geometry column to be named “geometry”. So, we’ll rename it here first. Apply GeoDataFrame dissolve aggregation method (implemented from lower level shapely operators) on level-7 Pfastetter codes (pfaf_7) shown in the plot above. Aggregate attributes, retaining only pfaf_7 and pfaf_6 (plus geometry, of course). This operation results in only 17 polygons, from the original 413. Let’s examine some of the features. Plot the results. Looks like the previous plot, except the polygon boundaries are now the pfaf_7 watersheds. Beware that dissolve may fail if there are “invalid” geometries. This code is based on a GeoDataFrame examined in the previous, intro notebook. The 6 geometries/points reported are invalid (and are reported by the is_valid() method). This dissolve statement does work, though. Partly so we can calculate polygon areas in linear units, not geodetic degrees. But also because that’s the projection used by most state and local governments in Washington. No need to go to a web site to learn more about what epsg:2927 is. Use pyepsg, which issues queries to http://epsg.io web services. Extract the epsg code from the string returned by crs['init'], then query epsg 2927. Apply the crs transformation (reprojection) using to_crs method. Plot the reprojected map. Note that, being in a planar project (not geodetic), the shape looks different compared to the previous map. More “normal”. And the axes are now in feet relative to some origin. As the projection is in feet, auto-calculated polygon areas will be in feet2. So let’s convert to miles2 first (why not!). We’ll add a new column to the GeoDataFrame. 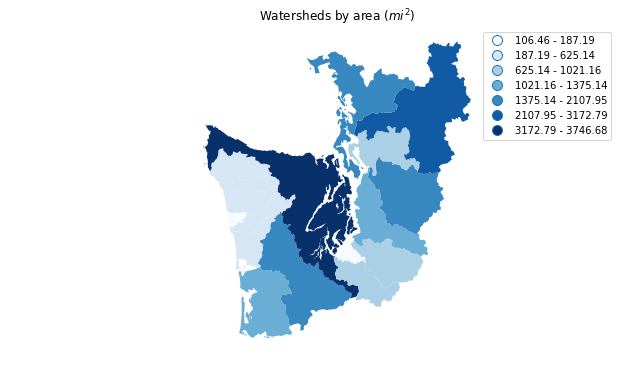 Now you could get the area of a pfaf_6 watershed via simple Pandas DataFrame groupby aggregation (sum). 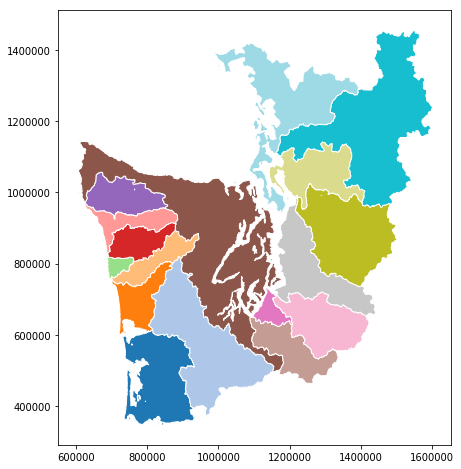 Plot the choloropleth, using area_mi2. Let’s stop for a bit to explore on your own, hack with your neighbors, ask questions. Folium is very cool, specially for use in Jupyter notebooks; or to export into stand-alone HTML. m.choropleth internally splits the geometry from the other attributes in hydrobas_ww_p7_wasp, and rejoins them based on the key pfaf_7. key_on uses an attribute reference derived from GeoJSON representations; this is awkward, and hopefully will be simplified in future folium implementations. This map is interactive, so play with it (zoom and pan). There is a lot more to explore in Folium! This is just a teaser. We’ll use an old, local snapshot of NANOOS coastal and marine monitoring stations in the Pacific NW, from the NANOOS Visualization System (NVS) Data Explorer. While many stations are moorings on marine waters, some are inshore or in tidal shores and will overlap the watershed boundaries. The point file is in the GeoPackage format, an OGC format implemented in SQLite. Points are on the coasts of the Pacific NW (BC, WA, OR) and out in the open ocean. Apply “inner” spatial join with the sjoin operator. An inner join will retain only overlapping features. Then plot as a map overlay on top of hydrobas_ww_p7, categorizing (coloring) each point by the pfaf_6 watershed it’s in. 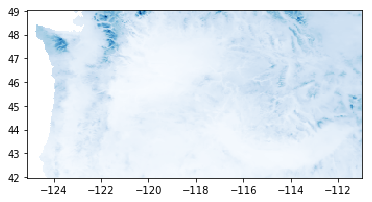 We’ll end by mixing features from a GeoDataFrame with a raster, applying zonal statistics using the cool and light weight rasterstats package. Monthly Juy long-term climatology precipitation. The original monthly time series data are from the PRISM Climate Group; the monthly climatology and Pacific NW clip were created by your truly and Don Setiawan for the BiGCZ project. rasterstas uses rasterio to read rasters (and fiona to read vector datasets), so we’ll first do a quick exploration of rasterio. Examine the metadata read from the raster file (we can confirm CRS is epsg:4326), then plot the raster. Apply zonal_stats from rasterstats package. Can pass a GeoDataFrame directly (instead of the file path to a GIS file) because it implements our old friend, the __geo_interface__ method. For the raster, we pass its file path. 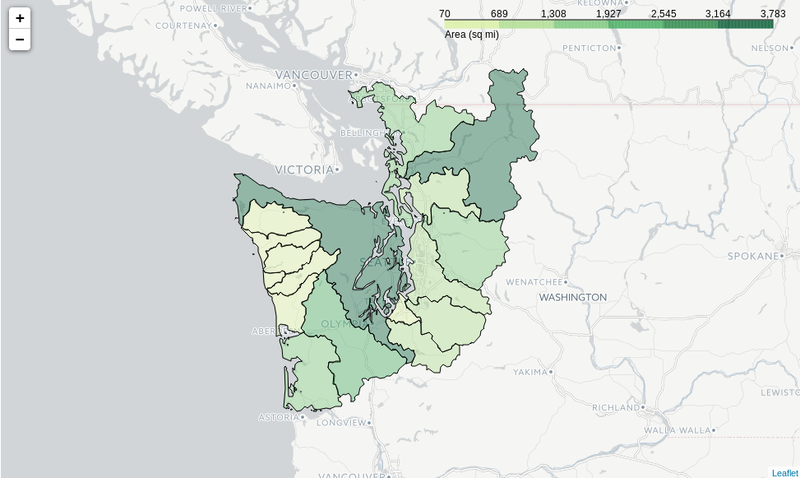 zonal_stats returns a geojson with the original properties plus the zonal statistics. 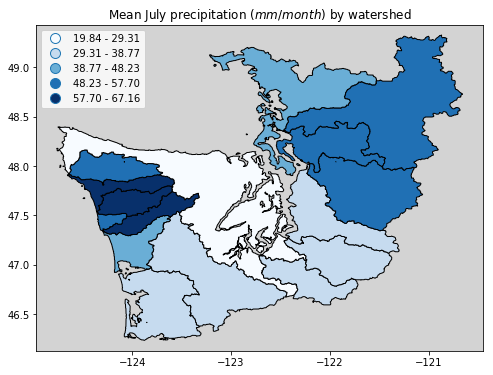 And finally, a choropleth map of July precipitation by watershed! With a good bit of plot tweaking. Use PySAL, the Python Spatial Analysis Library! It’s in the conda environment (version 1.14.4). This is a powerful, multi-faceted package. But watch out for the current transition from “version 1” to “version 2”. See the Python mapping libraries tour from OceanHackWeek 2018 last month. We illustrated rasterstats and rasterio. rasterio will be a pretty important component of your raster handling and manipulation toolbox. And it interacts with the GeoJSON-like objects we’ve examined; for example, see its features module. GeoPandas offers powerful capabilities and interacts with other tools. GeoJSON and the common __geo_interface__ enable convenient and widespread geospatial data object exchange across geospatial packages in Python.